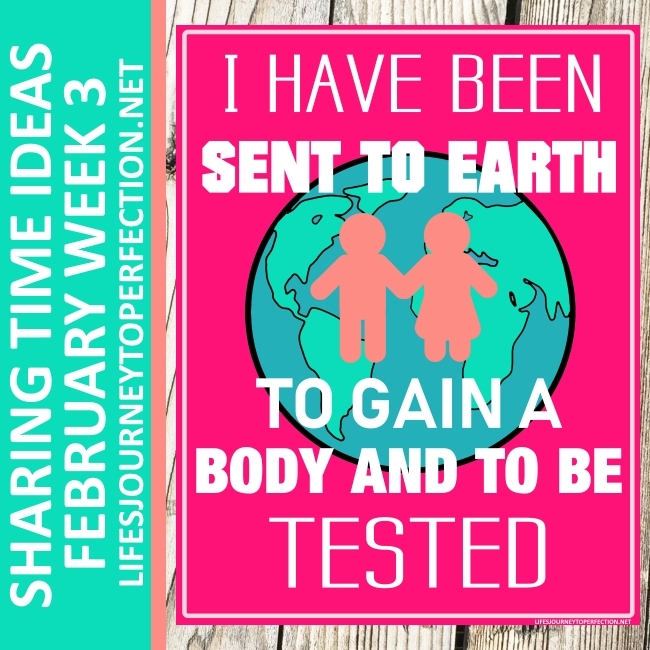 February Week 3 Topic: I have been sent to earth to gain a body and to be tested. 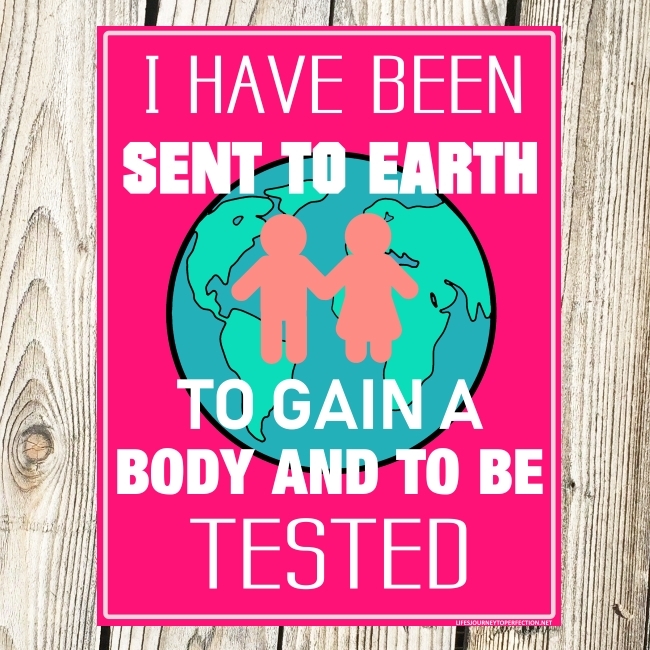 Show the primary children the week's theme poster and invite them to repeat, "I have been sent to earth to gain a body and to be tested." Ask the primary children, "Why was it important for you to come to earth and gain a body?" Explain that we wanted to become like our Heavenly Father. In order for us to become like Him, we needed to come to earth and gain a body. We also needed to experience things with our body, including being tested. Read Abraham 3:25, "And we will prove them herewith, to see if they will do all things whatsoever the Lord their God shall command them;"
So, what is our test??? To see if we will do all things our Heavenly Father commands us. Let's play a bean bag toss game. 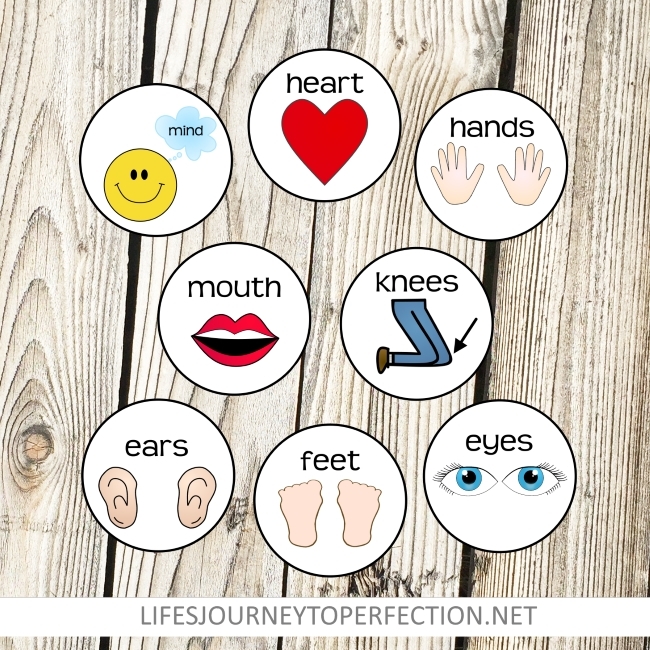 To play, print out the printables and place them face down on the floor. Invite a primary child to come up and toss a bean bag onto one of the cards. Turn it over and invite the primary child to tell everyone what is on the card. Then invite them to share something they can do with that body part to keep their Heavenly Father's commandments. Invite another primary child up and continue until all of the body parts cards have been discussed. Close by sharing your testimony on the importance of gaining bodies and being tested. Eyes: We can keep our Heavenly Father's commandments by watching and reading things that will invite the spirit. Ears: We can keep our Heavenly Father's commandments by listening to things that will invite the spirit. Knees: We can keep our Heavenly Father's commandments by kneeling to Him in prayer, both morning and night. Hands: We can keep our Heavenly Father's commandments as we serve others and reach out to them in love. Mind: We can keep our Heavenly Father's commandments as we keep our minds clean and pure. As we think about the Savior and make him our focus. Mouth: We can keep our Heavenly Father's commandments as we use kind words and as we share the gospel with others. Other things we can do with our mouths, is sing uplifting music, talk to our Heavenly Father in prayer, etc. Heart: We can keep our Heavenly Father's commandments as we love him and love his children. As we turn our hearts our our Heavenly Father and Savior. Feet: We can keep our Heavenly Father's commandments as we serve others, walk to visit a neighbor, increase our talents, take care of our bodies, etc. 2017 LDS Sharing Time Ideas for June Week 4: When I dress modestly, I respect my body as a gift from God. I really appreciate that you put all your hard work and ideas online to help others who are serving in Primary! Thank you for taking the time to put these together each week! It has made putting a lesson together for this newbie almost effortless. YOU ARE ME FAVORITE PERSON IN THE PRIMARY WORLD! I'm moving so I don't know if I'll be here for awhile but I wanted to tell you thank you for all the work you have put into these incredible lessons. The spirit was always felt because of it. Kim you are a special person! May you be blessed with all you need and want! Thank you so much!! I am so grateful you are using your talents to bless others to teach the gospel!! Thank you so much for all your ideas. It really helps me and make easier for me to do the sharing time for the primary. You are so talented, keep doing it and Heavenly Father will bless you more than you think. Kim, I love, love, love all your work and effort for making these lesson plans every week. And for making them FREE!! They have been a HUGE help for me, a convert, called as Primary President who knows nothing at all about Primary! I especially LOVE the weekly posters- I use them every week and move them to our monthly bulletin board after each class. I do have ONE favor to ask of you. This week’s poster in pink takes a huge amount of ink in order to turn a white sheet of paper pink. Would it be possible, and would you be willing, to make a less color heavy option? Maybe one without a colored background- like a plain white one that has just some color? Or even a black and white one that could be printed off onto colored paper? Just an idea! And again a huge THANK YOU for your help!! Thank you so much for sharing your talents! I love how your ideas are in harmony with the sharing time outline.